Since dogs don’t have an efficient cooling system they require plenty of water when out on a hike, walk, or run during warm weather, in order to avoid overheating. However, carrying water for your dog can be difficult and cumbersome. Here, the Gulpy Water Dispenser will be reviewed. 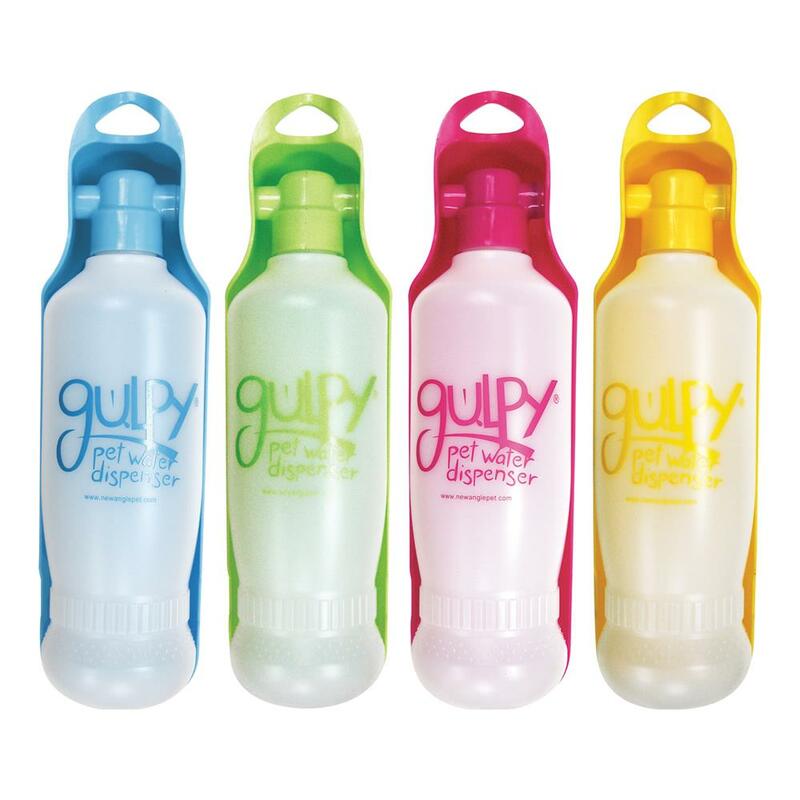 The Gulpy Water Dispenser is a 2-in-1 water bottle and water dish for your pet. It is easy and convenient to use, and has a belt clip that allows for the bottle to be easily attached to a pocket or belt loop. The bowl component folds against the water bottle, which minimizes the amount of space this product requires. Simply unscrew the lid (which is attached to the bowl), fill the bottle, and go. 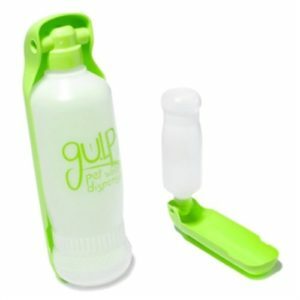 To use the Gulpy, unfold the bowl from the bottle, squeeze the bottle to fill the bowl, and encourage your dog to drink. The Gulpy’s bowl can even be attached to standard water bottles. This product holds 20 ounces of water, and is available in yellow, blue, orange, and green. The biggest advantage to the Gulpy Water Dispenser is portability. This bottle is easy to carry and does not require pet owners to carry an additional water bowl. The bowl is conveniently designed for all breeds and dog sizes. This product is also great for use during long car trips. There are few limitations to the Gulpy Water Dispenser. 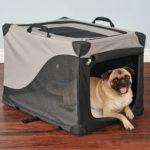 However, for large dogs or multiple pets, additional Gulpys should be purchased as the 20 ounce capacity might not be enough for the demands of these animals on warm days. Additionally, the bottle makes a distinct gurgle sound after water has been dispensed into the adjacent tray, which might be frightening for anxious dogs. Moreover, some dogs are hesitant to drink out of unfamiliar dog bowls, which could limit this product’s usefulness for those pets. One way to overcome this problem is to fill the Gulpy with cooled, low-sodium chicken broth instead of water, in order to encourage hydration. 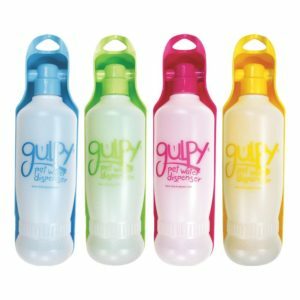 The Gulpy is best for pet owners who are looking for a convenient solution and portability when keeping their dogs hydrated during car trips, exercise, or camping trips. 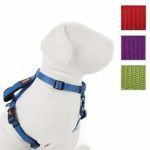 This product is best for smaller dogs or people who will have access to a water fountain or additional bottles of water throughout their trip. The Gulpy might not be appropriate for owners of multiple dogs or especially large pets. 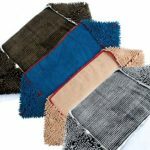 Similar items that are available include the Gulpy Jr., which is the 10 ounce version of this product, as well as the BOBIBI Portable Water Dispenser and the Ethical Pet Handi-Drink Pet Waterer. However, each of these products has a smaller water capacity than the Gulpy Water Dispenser described here. Ultimately, the Gulpy Water Dispenser is a great item for active pet owners and their pets. 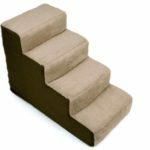 This portable, convenient design is lightweight and leak proof, and is also simple to use. The 20 ounce capacity is appropriate for most pets; however, extra water bottles should be packed for larger dogs.